What Color is Your Christening Gown? 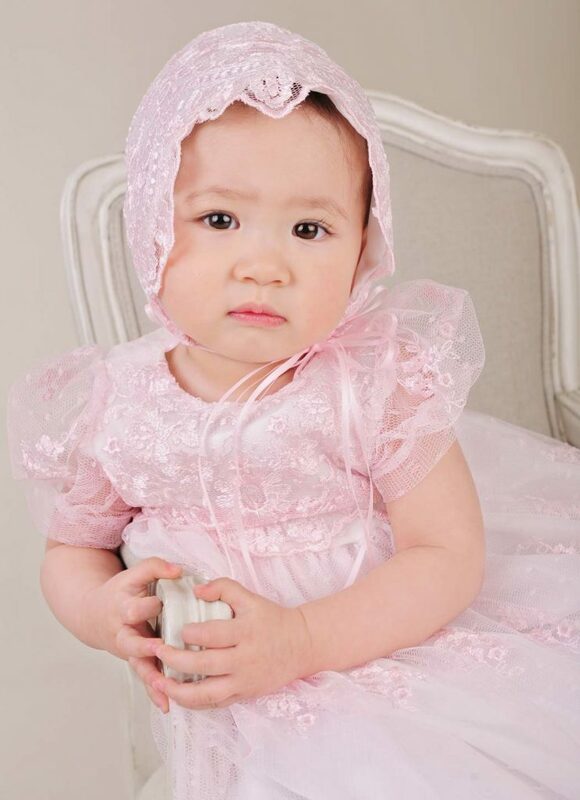 Have you ever considered going pink for her christening gown? Every congregation has different requirements…some prefer all-white attire for christening, but one of the trends of the past few years has been incorporating color into christening gowns and christening outfits. I must admit here that I like to do traditional with a little twist. My first baby girl was blessed in a gown very similar to our Jessa christening gown, of white silk dupioni with dainty pink rose braid trim. I went just a bit bolder with my second daughter’s gown: a rose-pink silk ruffled slip with a pretty over-coat of delicately embroidered french netting in a soft ivory color. And it was just beautiful. If you’re looking for something unusual, One Small Child offers several ways to introduce color in christening wear, from a tiny kiss of pink to entire gowns of mellow ivory or stunning pink. The boys are not forgotten, we also offer a traditionally cut romper in cool blue. So, are you up for a little color? 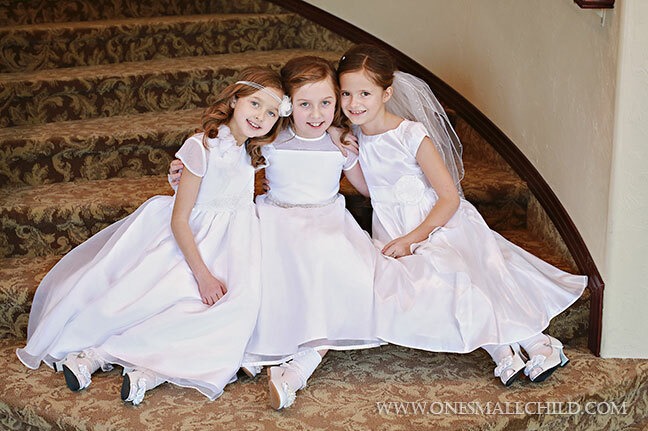 -Several of our christening gown and Communion dress styles feature crosses embroidered on skirts, woven into lace trims, or hand beaded all over. -Cross embroidery options are available on our simple cotton slip, bodysuits, bibs, blankets, and baptism towels. -Socks embellished with embroidered crosses are available in styles for infant boys and girls, as well as older girls. -Miniature bibles displaying crosses in gold tone or white lace are available in both Catholic and Protestant editions for your convenience. Christenings and baby blessings go hand-in-hand with parties. I can think of few better reasons to get all the friends and family together than to witness such a momentous occasion and share in your love for a precious child. Traditional christening gowns and outfits are beautiful, there’s no doubt, but when it comes to buckling baby into a car seat, or passing the little one from loved one to loved one, even I have to admit the finery can be a bit cumbersome. So, what’s the solution? After-christening outfits of course! 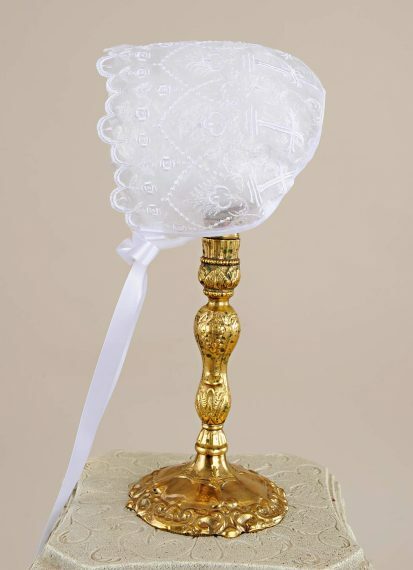 We have several options available, all of which are appropriate for using as christening or blessing outfits themselves if you’re wanting something a little less formal. Wow, where is January going? Don’t know about you, but we’re still recovering from the hubbub of the holidays and a quick family vacation…thus the radio silence over the past week or so. Sorry about that! Alrighty then, let’s get back to business. 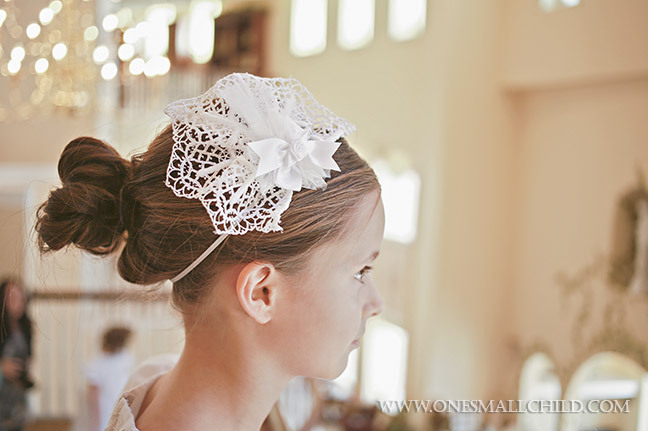 We’re pleased to be at the beginning of another First Communion season. It’s always an exciting and busy time of year, and we like to make things as easy as possible for you to shop for everything you will need, so in addition to our lovely dress selection, we’ve gathered an extensive collection of accessories, including veils, hosiery, handbags, Bibles, shoes and more. Well, it’s a new year, and one of our goals for 2008 is to cut down on the time it takes to cut, sew, and ship our non-stock items. 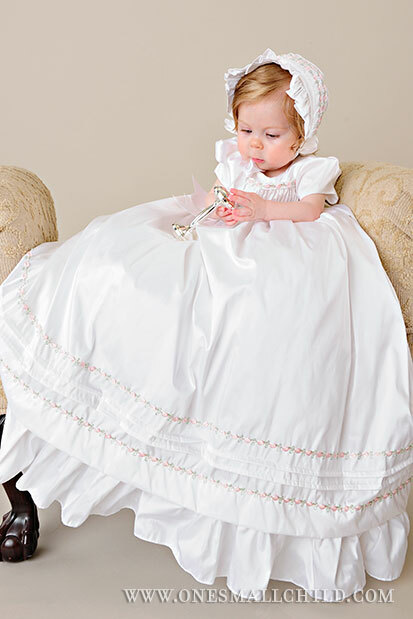 Thanks to the efforts of our fabulous sewing team over the past few weeks, we are pleased today to announce that our exclusive Jessa christening gown is now an in-stock item! Since we’re talking about the Jessa gown, I have to admit that it’s one of my favorites–it’s very closely based on the one-of-a-kind gown I created for my first baby, and it makes my heart smile every time I see one of these gowns in our production line or being inspected and prepped for shipping. I like to imagine all the pretty babies who get to wear this special christening gown, and the ‘oohs’ and ‘ahhs’ of all their loved ones. Sigh. I just love what we do!